AP / SdJ: You have been a very prolific artist in the last years since you moved from production to being an artist yourself. Your previous performances, Rupture, Asphyxia and Suspended, have been presented as each constituting one part of a trilogy. How do you see the relation between your current work and these previous works? Could you tell us something about the artistic trajectory that brought you to your current piece for the Tate Exchange Who Are We? project? 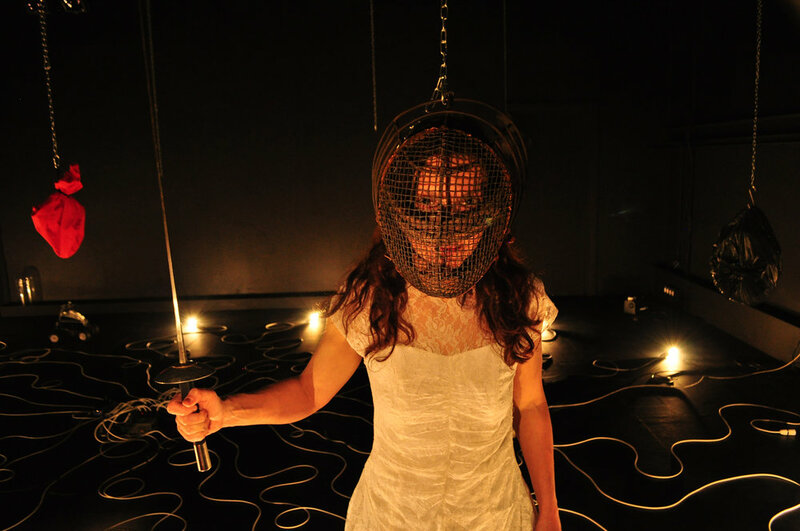 ND: In my research process for Rupture, Asphyxia and Suspended body was the starting point. I was interested in the impact of trauma of displacement on the body, what is stored in the body, what the body remembers. A lot of the experimentation with ideas involved stretching the boundaries of the body. In the consequent three performances (Internal Terrains, Teeth Show, and Fifty Rooms), the starting points in developing work were the space and objects more than the body, so the interest in memory became more architectural and cinematic. Again, each piece had an additional thematic focus. Internal Terrains was about forty addresses in less than four decades. Teeth Show used teeth as a metaphor for roots to reflect on the bio-political rights of migrants. Fifty Rooms is about migration and ageing, using stem cells and martial arts as reference points. Fifty Rooms (installation), which is my contribution to the Who Are We? project at Tate Exchange, is linked to the performance Fifty Rooms, premiering at Rich Mix London and Colchester Arts Centre in the same week. So for years I have been exploring the themes that Who Are We? focuses on during this week of events in the context of Tate Exchange. What is also common across all my performance pieces is their interdisciplinarity and sculptural, installational dimension, which makes it a very suitable base for the work I developed for the Who Are We? project. I have always been very interested in the physical defragmentation of the original performance material and its metamorphosis into something new, such as an installation, which resembles the process of integration into a new environment when displacement gradually gives life to a new form. AP / SdJ: Could you tell us how your work speaks to and addresses the question Who Are We? that is the framing theme of this exhibition? Who is the ‘We’ you interrogate with your work, and how do you do this? ND: The ‘We’ that I am interested in my work in general, but also in the installation that I am presenting as part of this fantastic project, are our diverse shared histories, backgrounds and experiences, displacements, our shared autobiographies. How we progress through life, deal with difficulties, what happens to us under the impact of traumas, how we recover, how our bodies age. I am interested in the body as a container of knowledge. I am also interested in the spaces we occupy, whether shared, communal spaces or private homes. I am interested in shared memories, significant pasts, presents that are out of balance, desired or feared futures. Where do our memories meet, how is the shared imagery formed in our collective histories, what objects, smells, situations and people do we remember? Personal experiences are a tool that I use, but I shape them in the way that they can be easily identified with. When I work with participants around the issues of displacement, I look at this issue rather broadly, not only in terms of geographical displacement. For someone the displacement will be within their own body because of some changes they are going through, such as menopause or becoming deaf, for someone else it will be the displacement due to having a difficult family background or history of abuse. Someone else will have been in prison for a decade or two and the displacement will be around re-learning to live in the world that has changed since they last actively participated in it. My installation for Who Are We? is a modified piece of furniture, it evokes a bed, but also a coffin, or a box in which somebody with a contaminating disease might be placed in the past to be transported between surgeries. As part of this weird bed there are also mini installations in its drawers, and these reflect, sometimes abstractly, sometimes more directly, on specific places, episodes from my past, situations I have been in, a place where I stayed or how I experienced my body at the time. There will be spare drawers for audience to engage in and make their own mini installation, as a personal visual comment on a particular moment in their lives, now or in the past, using the available materials and anything else they have with them on the day, such as items in their bags, a piece of jewellery and similar. These will be photographed and compiled for an online collection. I am hoping to achieve the balance between the personal and the general, between the familiar and the strange, and for the personal material to be experienced in the context of the political and the cultural. AP / SdJ: While your work has an autobiographical dimension, it transcends the individual and particularities by addressing larger questions of (non)belonging, citizenship, precarity, trauma and displacement. How, if at all, do you respond as an artist to current predicaments, times of political turmoil, which some have called ‘crises’ of various kinds? ND: Whilst I mention specific places in my work, such as Serbia or Syria, they are there in the function of ideas or experiences, such as fleeing a country in war on the last train, losing citizenship, getting ill, surviving a difficult situation by using unexpected resources, having to visit a dentist in five different countries, separation from the loved ones, living in several different countries without ever changing address, and so on. I try to work around these ideas so that they are experienced by the audience emotionally and empathetically, I want it to come across that people who find themselves in a migratory or exilic situation, wherever they are from, are just like us, it could happen to anybody. But I do not want to be didactic about it, I don’t wish to prescribe how the audience should feel. I prefer to ask questions and set up performative provocations, rather than provide answers. Any work that I have made, for example, in reference to the fall of Yugoslavia, relates easily to any other military conflict around the world. Bombed buildings in cities around former Yugoslavia bring to mind bombed and ruined buildings in other parts of the world, such as Iraq and Syria. Any personal stories around crossing borders and being a stateless citizen correspond directly to what Syrian refugees are currently experiencing, without me specifically making a direct reference to it. At any time or place in the history, the stories of being unwanted, as if one carries a contagious disease, are repeated whenever there is a large influx of migrants from a country in war. As audience we can attach ourselves to personal, individual accounts of lost homes, vulnerability, pain, we can identify with these experiences on an emotional level. And the personal is, of course, always political. Personal stories are also good for eliminating the notion of victimhood and bringing about the strength needed to survive, the strength that the majority of us will find when we absolutely need to be resourceful. In that way sharing autobiographical experience becomes on one hand a tool to draw attention to specific events or crises, and on the other a celebration of life and our ability to not just survive, but also thrive in precarious situations. Crossing borders, living in exile and in-between homes can be a difficult and traumatic experience, but it can also be an incredibly fertile space in which one can reinvent oneself. It is important to say, however, that basic human conditions in terms of shelter, access to work and medical, educational and social resources need to be satisfied first in order for the condition of exile to start balancing more healthily between the pain and pleasure, as George Lamming and Edward Said wrote about, or between the loss and liberation that I often focus my interests on. AP / SdJ: You describe in the essay ‘Rupture: Things that Throb in our Insides’ how in the late 2000s you started to explore and work on the relation between your own decaying body, and the decay of the land that once constituted Yugoslavia. The body as a metaphor of land, of a body politic, of a country has been significant throughout your work. How do you use your body, as well as manipulation of the body, and the relation between technology and the body, in your current work? ND: All three earlier pieces, Rupture, Asphyxia and Suspended, were interested in the notion of the body being out of balance, literally and metaphorically. I delivered texts, songs, episodes while balancing on a wobble board, on a layer of constantly moving apples, suspended from the theatre rig to which my hair is attached, and so on. But each of them also had a very specific focus that differed from each other. In Rupture this was cancer (the body falling apart in relation to the country falling apart). In Asphyxia this involved the breath, how the body performs when the breath is restricted and what can make us feel out of breath, such as crossing borders, family background, exilic history and so on. Suspended focused on the visual, there was very little text in it, the audience shared the performance space with me – in a way, together, we physically performed a migratory journey, which took us from one installation to another, some of them were participatory. Less text also meant that I focused more on choreography and that’s something that I took with me strongly into the next three pieces of work. Lately I have been more interested in the choreographed body movement in relationship to objects, whether that’s a lighting installation, an exaggeratedly long dress or a piece of modified furniture. I animate my own body in relationship to objects, sound, image and the space I occupy as a performer – in the service of the subjects I explore. This is enhanced by technologies I use in my performances, whether that’s sound, film, an interactive object operated by a remote control device, smoke machine, loop station etc. 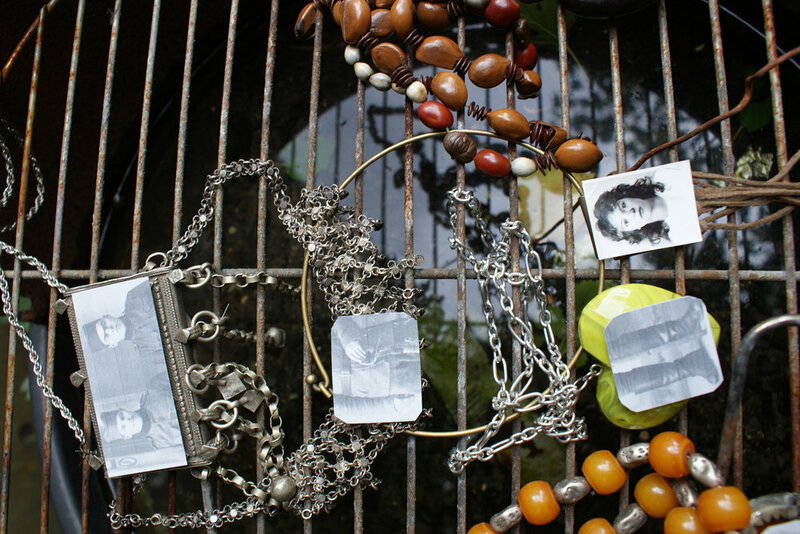 AP / SdJ: Your work has an autobiographical dimension, drawing on your own experience of forced migration and exile. You have been called an ‘exilic artist’ and commentaries on your work often refer to your migrant subjectivity. In how far do you feel that labels such as ‘migrant artist’ or ‘exilic artist’ are meaningful categories in general? Do you think that the category is adequate to describe (part of) your practice? In how far do you see this category as enabling and/or as constraining? ND: It’s true that my work has sometimes been described like that, but I haven’t experienced that negatively as labelling, especially when it’s useful to describe my work in those terms. As long as this doesn’t prevent me as an artist from showing work in other contexts. And this has never been the case. I have toured my performances, films and installations extensively across the UK and to five continents internationally. The work has often been programmed at venues as part of their general seasons, and at festivals that do not only deal with migration or indeed even with only socially engaging work, although personally I am much more interested in performing in venues and festivals that are progressive and political. And to be fair I have also been ‘labelled’ a live artist, multi-media artist, visual artist, emerging, established, British, Croatian but often I am just simply described as ‘an artist’. Personally I do not mind any of the above adjectives to describe any artist’s work, as long as they are used descriptively and not designed to pigeonhole them, devalue their work or put them in a specific box from which there is no way out. AP / SdJ: What is your artistic approach in developing a new piece of work? Where do you draw inspiration from, what can function as points of departure, and how do your ideas take shape in the process of production? ND: The interest in a subject and a specific artistic tool allowing me to explore it often appear at the same time. More practically, in terms of the layers of the work, methodology and tools, as I mentioned in one of the previous questions, sometimes I start with the body, sometimes with an object or objects, or with a sound, sometimes with text. For example in Teeth Show text came first, in Suspended text came last. Suspended started with a clear visual image of me suspended in the space, with my hair attached to the theatre rig, unable to move until the audience cut the strings of my hair and release me into movement. Asphyxia started with the physicality of breath. Internal Terrains started with a lighting installation – twenty cables with a lightbulb at the end of each cable, all connected to the central dimmer, which I control on stage. The rest of the material then develops around these central elements that define each piece, give it a shape and a reference point. I also work with collaborators. My regular collaborators for years have been Marty Langthornefor light design, Bob Karper for original sound, and Lucy Cash for movement and choreography. I usually do the initial research into the ideas on my own and bring raw material to them, which we then develop together in the rehearsal room, and they essentially help the material grow, they constantly provide feedback and ideas, and act as outside eyes. Through the whole development period and in parallel to everything we do together, I also work on photography and films, and I write and develop all texts. I am inspired by everything around me: current affairs, political situation, geographical references, landscape, but also by historical events, relationships with people, films, books, dance, visual work, autobiographical experiences, other people’s stories; everything really. 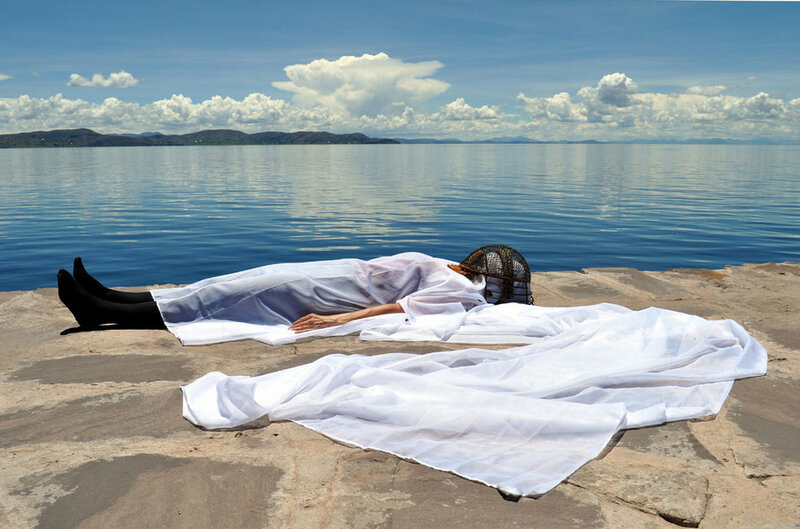 Natasha Davis is a performance and visual artist with over 40 solo and collaborative projects in a range of media including live performance, installation, film and publication. Her work has been shown in the UK (National Theatre Studio, Rich Mix London, Birmingham Rep, Barbican Plymouth, Playhouse Derry, Southbank Centre, Capstone Liverpool, Christie’s, Tate Modern and many others) and internationally in Cyprus, Greece, Ireland, Germany, Spain, Serbia, USA, Australia, India, Canada and South Africa. 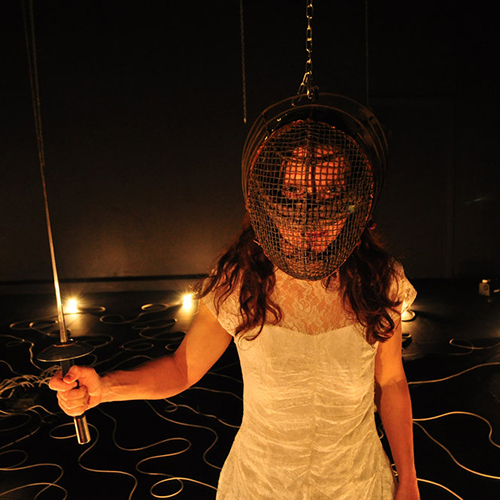 Her performance Internal Terrains heads the British Library’s online digital performance collection and is used as its banner and twitter icon. Her work is featured in ‘Traces’, a public project about migrant artists significantly contributing to UK arts, alongside artists such as Lucien Freud, Mona Hatoum and Frank Auerbach. Natasha has been funded by Arts Council England, British Council, Humanities Research Fund, Transatlantic Fellowship and numerous commissions and residencies. She holds a doctorate from the University of Warwick and delivers lectures, talks and workshops across the world, from Buffalo to Tokyo to Grenoble to New Delhi. Her work has been critically reviewed and written about in a variety of publications.